http://www.JewishWorldReview.com | Amid much gnashing of teeth, the Hamas victory in the Palestinian elections is being called a disaster. On the contrary. It is deeply clarifying and ultimately cleansing. If the world responds correctly, it will mark a turning point for the better. It is time to stop infantilizing the Palestinians. As Hamas leader Khaled Meshal said at a news conference four days after the election, "The Palestinian people have chosen Hamas with its known stances." By a landslide, the Palestinian people have chosen these known stances: rejectionism, Islamism, terrorism, rank anti-Semitism and the destruction of Israel in a romance of blood, death and revolution. Garbage collection on Wednesdays. Everyone is lamenting the fall of Fatah and the marginalization of its leader, Mahmoud Abbas. This is ridiculous. The election exposed what everyone knew and would not admit: Abbas has no constituency. Would it have been better to keep funneling billions of dollars from the European Union and a gullible United States to the thoroughly corrupt administration of a hapless figurehead? Billions that either end up in Swiss bank accounts or subsidize countless gangs of young men carrying guns? The current nostalgia for Fatah moderation is absurd. What moderation? Yasser Arafat's 1993 paper recognition of Israel's right to exist was as fraudulent as his famous Oslo side letter renouncing terrorism. He spent the next seven years clandestinely sponsoring it, then openly launched a four-year terrorist war, the most vicious in the history of the Arab-Israeli conflict. With this election, we can no longer hide from the truth: After 60 years, the Palestinian people continue to reject the right of a Jewish state to exist side by side with them. Fatah — secular, worldly and wise — learned to lie to the West and pretend otherwise. 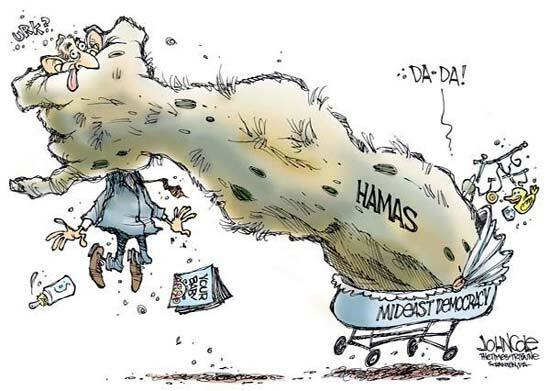 Hamas — less sophisticated, more literal and more bound by religious obligation to expel the Jews — is simply more honest. This election was truth in advertising. Now we know. What to do? The world must impress upon the Palestinians that there are consequences for their choices. And so long as they choose rejectionism — the source of a 60-year conflict the Israelis have long been ready to resolve — the world will not continue to support and subsidize them. And that means cutting off Hamas completely: no recognition, no negotiation, no aid, nothing. And not just assistance to a Hamas government but all assistance. The Bush administration suggests continuing financial support for "humanitarian" services. This is a serious mistake. First, because money is fungible. Every dollar we spend for Palestinian social services is a dollar freed up for a Hamas government to purchase rockets, guns and suicide belts for the "Palestinian army" that Meshal has already declared he intends to build. Second, because it sends the Palestinians precisely the wrong message. If they were under a dictatorship that imposed rejectionism on them, there would be a case for helping a disenfranchised Palestinian people. But they just held the most open and honest exercise of democracy in Palestinian history. The Palestinian people chose. However much they love victimhood, they are not victims here. They are actors. And historical actors have to take responsibility. They want blood and death and romance? They will get nothing. They choose peace and coexistence? Then, as President Bush pledged in June 2002, they will get everything: world recognition, financial assistance, their own state with independence and dignity. In August 2001, Hamas sent a suicide bomber into a Sbarro pizzeria in Jerusalem. He killed 15 innocent Israelis, mutilating many dozens more. A month later, Hamas student activists at al-Najah University in Nablus celebrated the attack with an exhibit, a mockup of the smashed Sbarro shop strewn with blood and fake body parts — a severed leg, still dressed in jeans; a human hand dangling from the ceiling. The inscription (with a reference to the Qassam military wing of Hamas) read: "Qassami Pizza is more delicious." The correct term for such a mentality is not militancy, not extremism, but moral depravity. The world must advise the Palestinian people that if their national will is to embrace Hamas — its methods and its madness — then their national will is simply too murderous and, yes, too depraved for the world to countenance, let alone subsidize. The essential first lesson of any newborn democracy is that national choices have national consequences. A Hamas-led Palestine, cut off entirely, will be forced to entertain second thoughts.